Congratulations to Dr. Paul Eldridge, FACT Standards Chair, and the FACT Common Standards Steering Committee on publishing the Second Edition FACT Common Standards for Cellular Therapies on March 15, 2019. The Standards will become effective on June 15, 2019. The Second Edition FACT Common Standards Steering Committee is comprised of 12 representatives who worked for 23 months on the development of the Standards. Everyone’s commitment, expertise, and experience is invaluable to these Standards. The Standards contain important additions and changes to requirements to reflect current processes typical in a cellular therapy program. These changes maintain the relevance of the Standards in the field of cellular therapy. During the 60-day public comment period, 240 comments were submitted by 19 contributors. The committee was responsive to public comments and requests made on behalf of related organizations. FACT greatly appreciates contributors taking the time to review the draft Standards and submit comments. If you have questions related to the Second Edition FACT Common Standards, contact your FACT Coordinator or submit your questions to askfact@unmc.edu. The FDA finalized the guidance titled, Standards Development and the Use of Standards in Regulatory Submissions Reviewed in the Center for Biologics Evaluation and Research, this month. This guidance describes the recommendations of the Center for Biologics Evaluation and Research (CBER) on the use of standards in product development and regulatory reviews. The guidance states that CBER may consider accreditation standards when assessing compliance with regulatory requirements, and includes FACT in its list of examples. A similar draft guidance titled, CDER’s Program for the Recognition of Voluntary Consensus Standards Related to Pharmaceutical Quality, is open for public comment through April 15, 209. This draft guidance proposes a program to publicize a list of informally recognized voluntary consensus standards related to pharmaceutical quality. The intent of this program is to facilitate submissions by external stakeholders, promote innovation, and streamline the compilation and assessment of marketing applications regulated by the Center for Drug Evaluation and Research (CDER). As a non-profit organization, FACT relies on dedicated volunteers to achieve its vision of being the premiere organization in setting standards and awarding accreditation to programs in the evolving field of cellular therapy. We consider our inspectors “the heart and soul” of FACT and are committed to showing our appreciation for their continued service. Our volunteer inspectors play an instrumental role in FACT’s success by devoting their time and expertise to complete more than one hundred FACT inspections each year. In December 2018 we distributed inspector recognition packets containing a thank you letter, a certificate acknowledging the year in which the inspector started performing FACT inspections, and the total number of inspections performed to date, as well as a FACT Inspector lapel pin. FACT Inspectors take care to professionally represent FACT when performing inspections. We are proud of the service they provide to FACT and our accredited organizations. 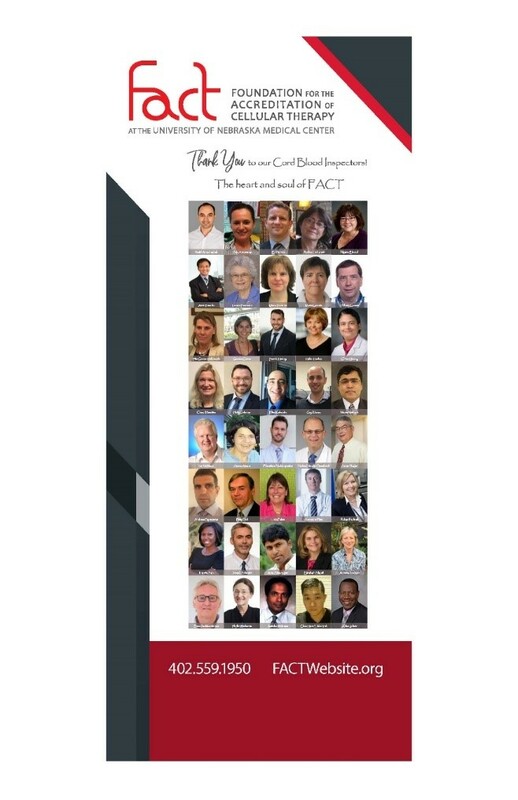 To showcase this amazing group of individuals, we compiled portrait photos of inspectors into display banners for cord blood and cellular therapy inspectors. The banners were exhibited at the FACT workshops during the 2018 Cord Blood Connect international congress September 14-16, 2018, in Miami Beach, Florida, and the 2019 TCT Meetings, February 19-23, 2019 in Houston, Texas. Not only are the banner displays an excellent opportunity for us to recognize our inspectors, but it has been said that a picture is worth a thousand words, and we could not agree more! Be sure to watch for the banners at future FACT workshops. FACT hosted its first Inspector Social Hour during the TCT Meetings in Houston on February 22, 2019. Attendees enjoyed hors d’oeuvres and cocktails while networking and socializing with peers after a long week of meetings. A list of active FACT inspectors is published on the FACT Website. The FACT Inspector Directory is updated quarterly and lists inspectors in order of country of residence and last name. Interested in becoming a FACT inspector? Submit the FACT Inspector Application located on the FACT website for more information. The achievements of FACT are attributed to the generosity of our volunteers in lending their time and expertise to the accreditation process. A sincere thank you to all our volunteers. Your excellence drives our success! FACT’s training and development program’s purpose is to respond to the current needs of inspectors and organizations, providing extensive opportunities for all skill levels in all corners of the world. 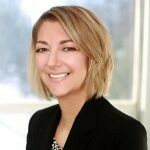 Recognizing that education is as important as standards and accreditation within FACT’s mission to promote quality in cellular therapy, the office has welcomed Roxanne Alter, MS, MLS (ASCP)cm as the Director of Education. Alter received her Bachelor’s Degree from the University of Missouri at Kansas City and continued her education in the Medical Technologist Program at Research Medical Center in Kansas City. She worked as a medical technologist in Blood Bank and Hematology for several years. In 1985, she took a position at UNMC working for Dr. James Armitage in the Autologous Bone Marrow Transplantation designing a laboratory to evaluate products for transplant. She received her Masters of Science Degree under the direction of Dr. Dennis Wiesenberger publishing the thesis “In-Vitro Clonogenic Monitoring Peripheral Blood Stem Cell Collections following Interleukin-3 administration.” Alter was offered a faculty position as an Assistant Professor in the School of Allied health, designing curriculum and evaluating educational outcomes for Medical Laboratory Scientists and other health professionals. After 20 years in education, she became the Nebraska State Biosafety Officer and inspected clinical laboratories across the state. Alter has a wealth of experience, which will serve her well in her new role as Director of Education. FACT-accredited organizations continue to grow by number, geography, and complexity. To maintain and build upon the support provided by FACT since its inception 23 years ago, the office has welcomed three talented individuals to the accreditation office. 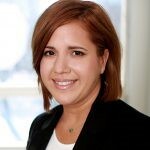 Nicole Gallardo joins FACT as an Administrative Associate. Originally from Germany, Nicole completed Vocational Training in Wholesale and Foreign Trade in Bremerhaven, Germany in 1992. Shortly after, Gallardo moved to the United States and worked at the Richdale Property Management Group as an auditor. In 2007, Gallardo accepted a position at UNMC’s College of Pharmacy as an Office Associate where she worked until joining the FACT team in the summer of 2018. In 2015, Nicole graduated from the University of Nebraska – Omaha (UNO) with a certificate in Public Management, and in May 2019, Gallardo will graduate from UNO with a Bachelor’s Degree in Multidisciplinary Studies with a concentration in General Administration, a milestone accomplishment. Sue Peters joins FACT as an Accreditation Coordinator. 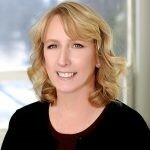 Sue is an ASCP certified Medical Laboratory Scientist, with extensive experience at the clinical microbiology laboratory at Nebraska Medicine, where cultures from cellular therapy products are performed, as well as cultures from transplant patients. She has also worked in the Microbiology/Molecular Department at the Nebraska Public Health Laboratory, where she gained experience in identifying strains of influenza, foodborne pathogens, and bioterrorism organisms. There, she also had the unique experience of working in the Biocontainment Unit with Ebola patients. 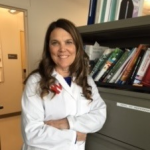 Sue then transitioned to the role as an Infection Preventionist at Nebraska Medicine, and from there as a microbiology supervisor at a biotechnology company before joining the FACT team in October 2018. Elda Nazario joins FACT as an Accreditation Coordinator. Originally from Sabana Grande, Puerto Rico, Nazario attended college at the Interamerican University in Puerto Rico, and graduated with a bachelor’s degree in Biology in 2002. In 2007, she graduated from Medical Technology School and worked as a Medical Laboratory Scientist in Puerto Rico for approximately 10 years. In 2016, Nazario moved to Omaha, Nebraska and worked as a Medical Laboratory Scientist at the Nebraska Medicine Laboratory at the Oakview Medical Building, and in October 2018, she accepted a position at FACT. As a fluent Spanish-speaking Accreditation Coordinator, Nazario will be integral to FACT’s initiatives in Latin America. Join FACT on Wednesday, May 15, at the Hilton Portland Downtown in Portland, OR, for a workshop designed to explain the requirements for FACT accreditation of cellular therapy programs, with special emphasis on apheresis collection facilities. FACT representatives will be in attendance to discuss cellular therapy collection challenges, provide examples on how to maintain quality when faced with different collection protocols, and present a common citations overview. This workshop also includes inspector trainee sessions on how to perform a FACT inspection from start to finish. The day includes a general track for attendees with separate breakout sessions for cellular therapy and cord blood participants. Inspector trainees are required to attend the inspector orientation track. Is your cell processing facility FACT accredited or looking to comply with FACT standards? Strengthen your quality assurance program through this interactive workshop with FACT experts and real world applications. Focused on issues identified by FACT-compliant transplant programs, these sessions will include activities and discussion in four main topic areas. Come prepared with your quality program questions and leverage quality experts to identify process improvement opportunities you can apply at your organization. Register for the entire module to receive a 15% discount! The WMDA-NetCord & FACT Cord Blood Day will highlight recent advances in cord blood transplantation and include global perspectives of cord blood transplants, common FACT-NetCord inspection citations, and more. The afternoon consists of two breakout sessions: a FACT inspector training track and a WMDA-NetCord & FACT cord blood quality boot camp track. We encourage banks to send multiple personnel to attend the various tracks as well as enlist a member to become a FACT inspector. This is an excellent opportunity to network with the cord blood community and learn from experts in cord blood banking. Registration fees are waived for FACT active and trainee inspectors. Apply to be a FACT inspector! Two tracks are available for this workshop. The Inspector Track will provide FACT inspectors guidance on how to assess compliance with the Standards. The Applicant Track will give programs and facilities insight into how to comply with the Standards and demonstrate compliance.